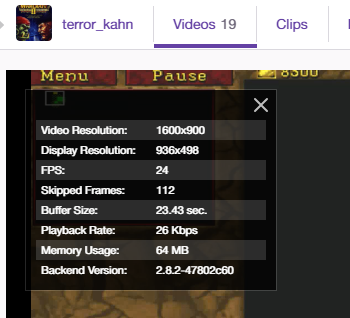 You want to check your bitrate depending on your connection I use 2500 for my setup but I am like super close to twitch server where I live. 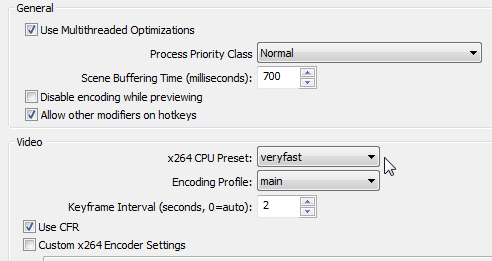 If that is the encoding and the cpu is a bit too used you can try using the nv encoder that uses your gpu instead I didnt need to change that and use the x256 one. for the resolution you want to make sure that any downscale happens in your video option. for fps value I use 59.9 which works nice for me. ill look at it when I get home thanks. Funny story.. I didnt even know fois was a programmer. When you typed "might need to instal fois ddraw" in your previous post i was like "maybe she mistaken"
I tried all of the things u mentioned (which i really apprecaite u taking the time to try to help/type out) .. but they didnt work unfortunately. i ended up msging fois to see if you did indeed type his name correctly and sure enough you did... we got to talking and tried messing with OBS classic some more with no success.. he ended up suggesting I use OBS Studio instead of OBS classic. instead of monitor capture, he had me change to display capture and manually change the aspect ratio from 1600x900 to 640x480 in settings > video ... streamed.. and works like a charm now. it's beautiful. again i appreciate the time.. but also good knowing that this should fix it for people having similar issues.